In her latest book “The heart has to hope for something”, Gerdien Jonker traces a section of European religious history in the kaleidoscope of a family memory. It tells the story of the Oettingers, a Prussian-Jewish family from Poznan, wich, like many Germans around 1900, was interested in Eastern philosophies and religious beliefs and converted to Islam between the World Wars on the basis of their amazing estate. Jonker brings this estate to speak and thus unfolds an unusual family history over seven generations between German-Jewish assimilation, a cosmopolitan Islam, survival under National Socialism and the new beginning in post-war England. This book tells the story of the Oettingers, a Prussian-Jewish family from Posen. Having been recognized as German citizens in 1836, the Oettingers turned from Prussian Jews into German patriots, showing their loyalty to the German Empire by getting their children baptized. However, they once again transformed into committed life reformers, who aimed at filling up everyday life with a new and deeper meaning. The women of the family, Emilia Oettinger and her daughters Lisa and Susanna, who followed up the existing Muslim avant-garde, and wanted to be part of a global world culture and become cosmopolitans. War and persecution was an existential caesura for them. However, they survived, immigrated to England after the war and once again got in touch with Muslim circles. For their children, Islam became the main focus of life as well, and they also thought about conversion as means for a final change. The story of the Oettingers does not stand by itself. Around 1900, many German-Jewish families got in touch with Eastern Philosophies and religions. There were also Christian families who felt rather drawn to religious alternatives than letting themselves being led from outdated structures of the Church. For some, the life reform movement became the starting point for a wholly new direction of family life. 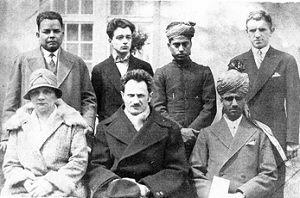 Between the wars, the next generation already experimented with variants of “Eastern Wisdom”, a European interpretation of the East that carved the way for Hindu, Buddhist, Bahai and Muslim missionaries. The book shows the starting points of this religious individualization, which has left marks up until today. 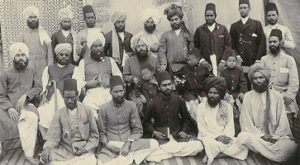 1901, the Indian reformer Mirza Ghulam Ahmad gathers his followers around him, wanting to show what “modern” means to the Ahmadiyya. For him, it is nothing less than the right balance between indigenous and Western knowledge. The turban symbolizes the Indian-Muslim aristocracy and hence the connection to tradition. Here, Persian literature is more important than knowledge of Arabic. A true gentleman deals with the art of Persian Ghazals much more than with the interpretation of Koranic verses. The Fez symbolizes knowledge and enlightenment towards “the West”. It is seen as THE western headgear. It’s owners have studied at English universities and master the “old” as well as the “new” sciences. The Koran, which can be seen in the hands of many of the men in the picture, shows that they are trained to be missionaries. In a couple years, they will be welcomed in Europe as representatives of a new and progressive Islam. 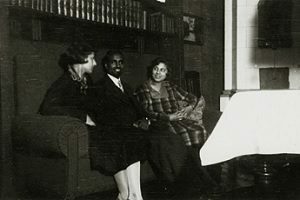 In 1928, Sheikh Muhammad Abdullah enrolls at the Berlin University, planning to write his dissertation in physics. The Ahmadiyya society of Lahore has already built a mosque in Berlin and appointed him as Missionary for the growing community. The photo shows his first encounter with the Jewish Oettingers. Susanne Oettinger (on the right) teaches German. Lisa Oettinger (on the left) is a student at an art academy. This encounter will align all their lives in a new direction. In 1930, the mother of Lisa and Susanne, Emilia Oettinger, becomes co-founder of the “Deutsch-Moslemische Gesellschaft e.V.” (German-Muslim Society). Her job is to represent the issues of women. The photo was shot on the day of the foundation. Next to Emilia, there is Hugo Marcus, president of the society, who is philosopher, Jew and homosexual and who has already converted to Islam in 1925. He represents the intellectuals. Next to him, there is S.M. Abdullah, missionary by profession. Behind those three, we can see the four members who are to integrate most important interest groups in the mosque community. Firstly, there is Dr. A. Mansur, a doctor from Egypt, who represents the Non-Ahmadiyya-Muslims in the mosque. Next to him, there is G. Gutzkow, representative of the rather big group of Prussian aristocrats and of former military officers. The Prussian aristocracy forms its own group in the society. They have a military interest in Islam and carry this perspective from the First to the Second World War. Next to Gutzkow, there is M.T. Ahmad, the treasurer. At this time, Ahmad is still student in Medicine at the Berlin University. His headgear shows that he belongs to the owning Indian class. On the right side of the picture, we can see Werner Omar Schubert, who has joint the NSDAP even before 1930. In the society, he will support those who feel drawn to National Socialism. This potpourri of people will decide in the 1930ies to 1940ies on how Islam will develop in Berlin and how it will be perceived by others. 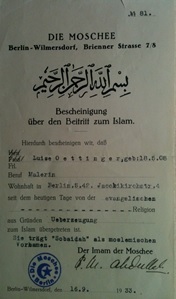 In 1933, Lisa Oettinger converts to Islam as the first member of the family. Her mother and sister will only follow this step later on. Her assets show that she was serious about it. Hand-written poems, Sufi poems and a selective of German life reformers, who tried to establish new ways to religion, show that she did not only care about a way to live her life but rather wanted to approach the divine mystery (mysterium tremendum) – as really personal experience. Between Jews and Muslims is based on the assets of the Oettinger family, a commented collection of personal belongings, documents and photographs that is being held in a shrine by the descendants of the family up until today. Its discovery allowed reconstructing the personal decisions of seven generations of a family, which tried to actually give a meaning to phrases like reform, modernity and progress in religious individualization. What appeared was a chapter of European religious history through the eyes of a family. Muslims have been living in Germany for decades, but still many of them are seen as foreign, sometimes even as a threat. With his profound survey on Islam in Germany, Mathias Rohe contributes to the objectification of the topic. His book describes the history of Islam in Germany as well as the variety of current Muslim living realities. It shows the importance of different religious orientations and cultures and screens the manifold Muslim organizations, initiatives and and positions existing in Germany today. In the center of his research he puts the question on how Muslim life can unfold itself in German everyday life: Which barriers exists for mosques, minarets, prayer calls or religious dress codes? How can ritual commandments – such as fasten, circumcision or religious slaughter – be integrated into German everyday life? How are the state and Muslim organizations collaborating? Are Islamic Norms compatible with German law? Finally, Rohe asks about perspectives on peaceful co-existence in times of refugees, muslim-religious extremism and Islamophobia. His work is an indispensable foundation for everyone who aims at taking part in the discussion on Islam in Germany without illusions or anxieties. Meltem Kulaçatan puts the gender relation in the public media in focus, which is based on her studies of the press discourse of the European editions of the Turkish daily papers Hürriyet and Zaman. Based on the German-speaking majority public, the public in Turkey and the Turkish-speaking part of the public in Germany, the author analyses the spatial and content discursive entanglements on the basis of gender discourse. These discourse entanglements can be observed in the gender relations in Turkish newspapers, which are closely intertwined with the politics in Turkey. At the same time, the press discourse on gender relations is entangled both with the integration discourse and the policy discourse in Germany, which is reflected in the media coverage of Turkish and Islamic women. The Sharia has become a term of horror in the West. For many Muslims however, it is an essential part of their self-perception. With his Introduction, Mathias Rohe wants to contribute to an objective discussion on the subject. He shows the origin of the sources of the Sharia Law, its essential content and how it is currently evolving in the Islamic world, but also in Germany and Europe.